Aldrich is one of the Lords of Cinder. He is also known as the Saint of the Deep. Aldrich was formerly a holy cleric who had an insatiable appetite for human flesh. At some point during the Church’s battle and eventual submission to the Deep, the man-eater Aldrich somehow joined their ranks. Thus, he began his journey to power. His growing strength eventually transformed him into an abomination and he became a Lord of Cinder. While thinking on the fading First Flame, he began to have visions of a "coming age of the deep sea", from which he founded the Church of the Deep, utilizing a darkness, far beyond that of Humanity, known as the Deep. Initially, Aldrich worked to seal or otherwise keep monsters at bay that spawned from the Deep. He also worked to keep foolish humans from trying to access the Deep’s powers. Aldrich's visions of an age after the Age of Fire led him to seek the power to be able to travel the difficult path that leading into the new age. The Church of the Deep was founded to serve Aldrich and provide a steady stream of sacrifices, overseen by Pontiff Sulyvahn and Archdeacon Royce. Unfortunately, the power eventually consumed him, and the Church of the Deep appears to have become nothing more than a group that waits on and supports Aldrich by burning people or bringing them to him to consume. Aldrich was not the only one in power in the Church of the Deep. He was at the top, but there were three Archdeacons below him: Royce (who remained in the cathedral with the high priests to watch over Aldrich’s coffin), McDonnell (who originated from the Boreal Valley and taught the Church sorcery), and Klimt (who left the Church of the Deep to stand with Aldrich when he left for the Boreal Valley). After Aldrich was revived as a Lord of Cinder, he began dreaming of the Old Gods and sought to devour them. Sulyvahn travelled with him to Anor Londo and managed to capture Dark Sun Gwyndolin who sacrificed himself to save his sister, Company Captain Yorshka. She managed to evade capture, but Aldrich devoured Gwyndolin. Aldrich was worshiped for his vision of the future. He founded the Cathedral of the Deep on the premise that the Age of Fire should be succeeded by an age where the world is covered in a giant ocean, and the "dregs of humanity" would sink to the bottom of this ocean and serve as an anchor for the world. He envisioned the Abyss as the real-world bottom of a trench in the sea as opposed to an endless expanse of blackness. The people followed him, though his vision was the antithesis of what the other Gods wanted, which was to keep the cycle going by linking the Flame, but Aldrich sought the dark. When the Deep turned from a peaceful place to one full of horrors, Aldrich worked to contain the monsters that spawned from the Deep, and also worked to keep foolish humans from trying to access the Deep’s powers. It's unclear what the Church of the Deep did anymore aside from wait for, or support, Aldrich and burn people. The evangelists prepared Red Bug pellets and gave them out to followers to ease their suffering when they burned. Anri of Astora says, " We reached the Cathedral of the Deep, but… Aldrich's coffin was empty. The man-eater must have left for his true home. The little doll in the empty coffin told me Aldrich is said to hail from Irithyll, in the Boreal Valley. An ancient, fabled city…" The little doll she is referring to is the Small Doll, which is described as a "Small silverwork doll depicting a young squire. In the legendary old city of Irithyll situated in the Boreal Valley, the Pontiff Sulyvahn gave this doll to valued subjects, so that they might use it to cross the barrier when they return home. Listen carefully, and you can hear it say, "Wherever you go, the moon still sets in Irithyll. Wherever you may be, Irithyll is your home." Perhaps Pontiff Sulyvahn was connected to Aldrich before his rise to power as Lord of Cinder, not after. 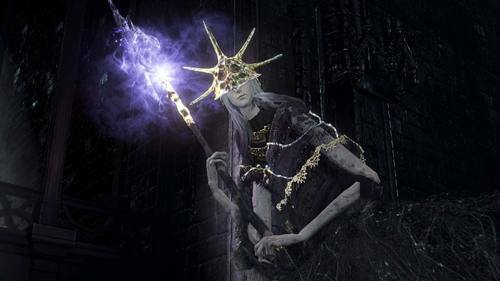 Sulyvahn discovered lost Irithyll, but his soul describes his connection to Aldrich: "Pontiff Sulyvahn of Irithyll imprisoned a god of the old royalty in the abandoned cathedral, to be fed to the devourer." Aldrich may not have been born in the Valley, but he certainly spent time there before the Church. It is clear that he heard of Pontiff Sulyvahn's powers from Royce, and set out to learn how to devour Gods from him. But, Anri tells us that "the man-eater must have left for his true home. The little doll in the empty coffin told me Aldrich is said to hail from Irithyll, in the Boreal Valley." The blade on the end of his staff is the Gravelord Sword; this has led many to speculate that he may have devoured Nito as well. However, there are no other lore implications to support this claim, as Nito was destroyed in Dark Souls 1. 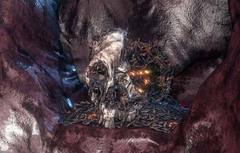 On the other hand, Darkmoon Gwyndolin was also beaten in Dark Souls 1, so it is unknown whether or not it is possible that Nito was indeed consumed. Examining the floor, the bones of the many hundreds, possibly thousands of beings that Aldrich has consumed may be seen floating within the sludge. Given his use of the Gravelord's sword and that his own body is, effectively, a mass grave; Aldrich may be considered the new Gravelord in replacement of Gravelord Nito, whose own body was also an aggregate collection of bones, rather than a reincarnation or corruption of Gwyndolin whom he merely manipulates as he would a puppet during this encounter. Maybe by consuming Gwyndolin, Aldrich gained his memories of other gods and powerful individuals, allowing him to channel Nito's Gravelord Sword. "We seek the cathedral, home of the grim Aldrich." "We reached the Cathedral of the Deep, but Aldrich's coffin was empty. The man-eater must have left for his true home. The little doll in the empty coffin told me. Aldrich is said to hail from Irithyll in the Boreal Valley, an ancient fabled city…"
"Ahh, I thought it might be you. No, this only bolsters my resolve. Please. Lend me your strength. Help me vanquish Aldrich, the man-eating fiend." "Ahh, I thought it might be you. Then I'm afraid Horace is… No, this only bolsters my resolve. Please, lend me your strength. Help me vanquish Aldrich, the man-eating fiend." Upon defeating Aldrich: "I owe this to you. Thank you. Truly. Horace we've done it. We really have…"
[Aldrich was a] "right and proper cleric who developed a habit of devouring men. He ate so many that he bloated like a drowned pig then softened into sludge, so they stuck him in the Cathedral of the Deep and they made him a lord of Cinder. Not for Virtue, but for Might. Such is a lord, I suppose…"
When Aldrich ruminated on the fading of the fire, it inspired visions of a coming age of the deep sea. He knew the path would be arduous, but he had no fear. He would devour the gods himself. Miracle of Aldrich, Devourer of Gods. Steals HP of foes using an illusory scythe. Aldrich dreamt as he slowly devoured the God of the Darkmoon. In this dream, he perceived the form of a young, pale girl in hiding. Longbow of Darkmoon Gwyndolin. who was gradually devoured by Aldrich. This golden bow is imbued with powerful magic and is most impressive with Moonlight Arrows. The holy symbol of the Cathedral of the Deep, and crest of those who see beyond fire to the age of deep waters. Cinders of a lord left by Aldrich, Devourer of Gods. If the lords will not return to their thrones themselves, let them return as cinders. interesting theory. I would like to add that it is a possible as his form is sludge? as can be seen in the cinematic trailer. Unlikely. The sludge starts from where the corpse of the giant blacksmith is.